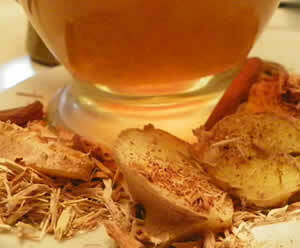 This pleasant tasting root tea is used as a blood purifier and cooling summer drink. It is a morning favorite of mine for arthritis, backache and sore muscles. Additions: Flavor with a bit of raw honey to bring out the flavor of the roots. Recipe Instructions: Decoction :Bring to a boil over a low heat, simmer for 10 minutes. Let steep until cool enough to drink.